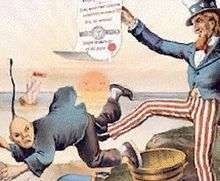 United States political cartoon: Uncle Sam kicks out the Chinaman, referring to the Chinese Exclusion Act. Image published in 19th century. Xenophobia is the fear of that which is perceived to be foreign or strange. Xenophobia can manifest itself in many ways involving the relations and perceptions of an ingroup towards an outgroup, including a fear of losing identity, suspicion of its activities, aggression, and desire to eliminate its presence to secure a presumed purity. Xenophobia can also be exhibited in the form of an "uncritical exaltation of another culture" in which a culture is ascribed "an unreal, stereotyped and exotic quality". The terms xenophobia and racism are sometimes confused and used interchangeably because people who share a national origin may also belong to the same race. Due to this, xenophobia is usually distinguished by opposition to foreign culture. Xenophobia is a political term and not a recognized medical phobia. A scholarly definition of xenophobia, according to Andreas Wimmer, is "an element of a political struggle about who has the right to be cared for by the state and society: a fight for the collective goods of the modern state". In other words, xenophobia arises when people feel that their entitlement to benefit from the government is being subverted by other people's rights. The term "xenophobia" was invented by the ancient Greeks, to "describe a reflexive feeling of hostility to the stranger or other." An early example of xenophobic sentiment in Western culture is the Ancient Greek denigration of foreigners as "barbarians", belief that the Greek people and culture were superior to those of others, and the subsequent conclusion that barbarians were naturally meant to be enslaved. Ancient Romans also held notions of superiority over other peoples, such as in a speech attributed to Manius Acilius, "There, as you know, there were Macedonians and Thracians and Illyrians, all most warlike nations, here Syrians and Asiatic Greeks, the most worthless peoples among mankind and born for slavery." ↑ "Xenophobia - definition of xenophobia in English from the Oxford dictionary". oxforddictionaries.com. ↑ "Xenophobia - Define Xenophobia at Dictionary.com". Dictionary.com. 1 2 Guido Bolaffi. Dictionary of race, ethnicity and culture. SAGE Publications Ltd., 2003. Pp. 332. 1 2 "Xenophobia". United Nations Educational, Scientific and Cultural Organization. Retrieved 18 July 2016. ↑ Wimmer, Andreas (1997). "Explaining xenophobia and racism: A critical review of current research approaches". Ethnic and Racial Studies. 20(1). ↑ Fredrickson 2009, p. 6. ↑ Harrison, Thomas (2002). Greeks and Barbarians. Taylor & Francis. p. 3. ISBN 9780415939591. ↑ Isaac, Benjamin H. (2006). The Invention of Racism in Classical Antiquity. Princeton University Press. p. 317. ISBN 9780691125985. ↑ Giliomee, Hermann (2003). The Afrikaners: Biography of a People. C. Hurst & Co. Publishers. p. 383. ISBN 9781850657149. ↑ "Anti-Indian Legislation 1800s - 1959". South African History Online. Retrieved 27 June 2016. ↑ "Xenophobic violence in democratic South Africa". South Africa History Online. Retrieved 29 June 2016. ↑ "South Afrians Take Out Rage on Immigrants". The New York Times. 20 May 2008. Retrieved 29 June 2016. ↑ "Thousands seek sanctuary as South Africans turn on refugees". The Guardian. 20 May 2008. Retrieved 29 June 2016. ↑ "Thousands flee S Africa attacks". BBC NEWS. 19 May 2008. Retrieved 29 June 2016. ↑ "Analysis: The ugly truth behind SA's xenophobic violence". Daily Maverick. 28 May 2013. Retrieved 29 June 2016. ↑ Kazunga, Oliver (20 April 2015). "Xenophobia death toll climbs to 7". The Chronicle. Retrieved 30 June 2016. ↑ "Deaths in South Africa as mobs target foreigners". Al Jazeera. 15 April 2015. Retrieved 30 June 2016. Fredrickson, George (April 30, 2009). Racism: A Short History.